Relief, the sale is over! I was concerned about the heat and the humidity, being a creature of air conditioning this summer. I survived it well, thanks to the shade tree they carefully selected for me in back of our tent location. Our new set up worked well, giving more space to our customers. Lucky for me I could sit in back of the tent where it was cool, and Hannah, my daughter just inside the tent with the tent walls rolled back for the morning. We enjoy our contact with customers and friends, a bit of a reunion for us, and for me add to it the excitement of getting out of the house for a whole day and taking in all the new creations of our friends! We returned home early, weary and a bit wet after being rained out in the afternoon. 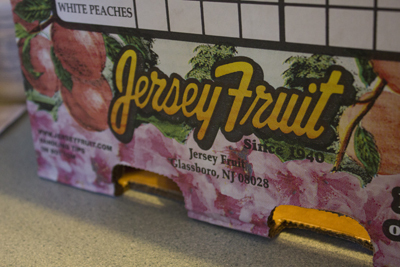 Seventy-five pounds of tree ripened peaches greeted us. 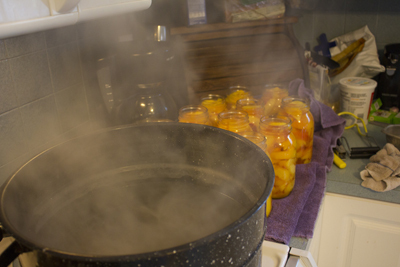 Their sweetness was divine, and worked well to revive us, though I went to bed early, so I could be up and ready for canning in the morning. “No rest for the wicked”, my mother used to say, and I know that I must fall into that category as no matter how I try, my energy doesn’t seem to go far enough to do all that I want to do. Perhaps it is my greed for living life to the fullest that is my problem! Our canning was over in about four hours, thanks to the “many hands making our work light”. Hannah was in charge, dropping our peaches into boiling water. Then after plunging them into ice water, I took over, popping their skins. Delighted to see that their beautiful blush remained, I placed them into another bowl laced with lemon juice until they were sliced by my husband. 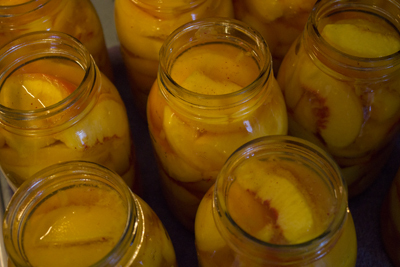 Back into their lemon water bath, the slices remained until Hannah packed them into jars and poured hot syrup over them, and then finished them off with a water bath canning process. Hannah and I love to can, or perhaps that should read that we love the idea of putting up beautiful fruit to be enjoyed all through the year (39 quarts). Perhaps we are part squirrel? Our favorite peach recipe has been a fruit crisp. Hannah pours the light syrup from the canned peaches over the other frozen unsweetened fruit that she combines with our peaches; sometimes strawberries, sometimes rhubarb, or blueberries, adding their tartness to her crisp. A mixture of sugar, oatmeal, butter and flour is then added to the top. There is occasionally an extra dish to have for breakfast in the morning! Aren’t fruit crisps or pies really breakfast food? And to think of the hours I spend planning my weight loss diets! The point? Hannah doesn’t tell us, but she has frozen a tray of sliced peaches to make into homemade peach ice cream. What is a dieter to do? Certainly, I am not to forego this extra treat! Our Little House is now suffering from our wares spread about in the basement and dining room, drying out from the extra humidity from our day out. Though it poured rain in the afternoon, all but our tent and bunting stayed dry. But our quick departure means a bit of reorganizing before putting our wares on the shelf and no matter how I try, I am not fast enough to keep up with getting everything done. 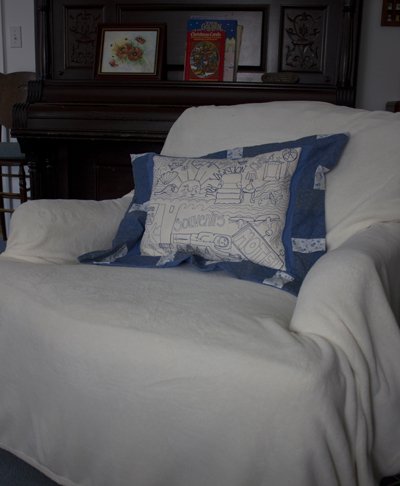 No, after a sale it is time to sit in my Vacation Chair, made beautiful by its recent addition of a Vacation Chair Pillow made by my friend and fellow artist, Maria Wulf. We were so blessed to have her and Jon make it to our show in the nick of time, as the rain shortened our day. It was a planned rendezvous where Maria and I were to trade our wares. I so admire her artistic free motion-quilted pillows, among other things. 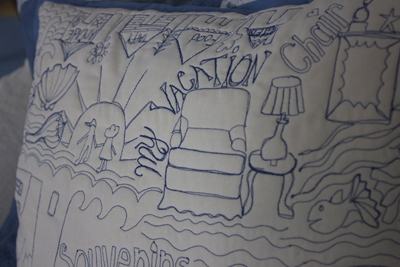 They are story pillows, and she took my Vacation Chair Story and beautifully quilted it into my pillow. I will let you read this pillow yourself, before I go on to tell you the story of my Vacation Chair. In fact, the future telling of my story will likely be redundant, for her pillow tells it all! Thank you Maria, I love it! Do visit Maria on line at www.fullmoonfiberart.com and be sure to meander through her blogs! You are in for a treat, and don’t miss her husband’s blog at www.bedlamfarm.com/blog. Jon Katz is a New York Times bestselling author and you will soon prefer reading his daily blog news each day, to the news of our wild and wicked world. Jon’s news makes me reflect on what is really important in my life’s journey. I find his readings gentle and soothing to my soul. It is so delightful to discover another favorite author, and I look forward to packing in more of his books for my winter reading feast and getting better acquainted with his thoughts! I am only sorry that I have not discovered his works years earlier! Both Jon and Maria are lovely and kind folk that will touch your heart as they have touched mine. Their rural country life style combined with their tender love of their animals and neighbors will warm you and make you feel secure, much like Fred Rogers did when he would put on his sneakers and sweater. Jon welcomes you to his and Maria’s farm and openly and candidly shares his experiences and struggles and validates all that it means to be a truly loving human being. Their move to their new and smaller farm right down the road is going to make for more delightful reading to be sure! I am glad that my daughter didn’t see Maria’s contest to win the terrifying shower curtain. Like Maria, I prefer something a little more friendly to greet me in the night, like my yellow ducks or rose theme bathrooms. I am enjoying their sharing of their new “old” home decorating experiences! It calls to mind us re-doing our rented farmhouse of years ago, combining our furnishings with the built in history of an old farm house! We are eager to pay them a visit after they get settled, and on-line, Jon and Maria will welcome us all to their new location! Oh Jane, Your display at the fair was so lovely! 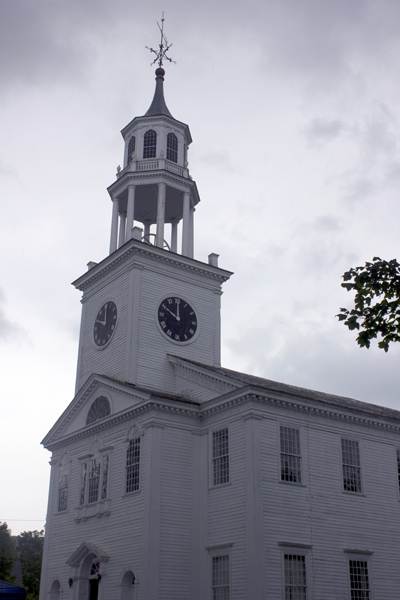 We had wanted to make the trek from Millis MA but I totally got my dates mixed up.I so wanted to say Hello to you. 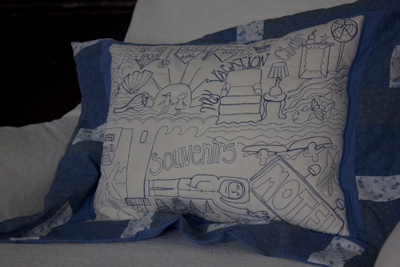 :)I saw your vacation pillow and the pincushions Maria chose on her blog. Yes, she's amazing. I have several of her pieces. My pincushion display is on my mantel. Do you still have the "gone fishing" pincushion? Your home and time with your daughter sound so sweet. I love spending time with my daughter and two grandkids.They are such a gift aren't they? Cindy - my email to you got returned and so I will post my reply here! Thank you for your lovely compliments! My “gone fishing” pincushion is no longer available but if you care to special order one similar to it, providing I can still get the buttons I would be happy to make one for you. It would likely take perhaps two to three weeks to do, with the other items that I need to make to keep supplied for my sales coming up here soon. 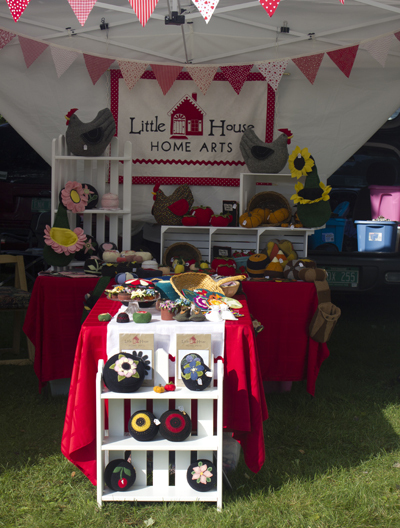 Some of my pincushions are a one-of-a-kind sorts, so it may not turn out exactly like the last one. I believe that I used some hand-dyed material that I had on hand for the one that was photographed, which adds another variable that may make the next different, but do know that I am open to trying most anything that you would have in mind and would be happy to photograph material and threads to choose from if you want a hand in designing your own. I love the pillow that Maria made for me and just today, I wrote “The Rest of the Story” about it for an upcoming blog. She did such a great job including all the different bits of the vacation that led me to my Vacation Chair. I really enjoy both Jon and Maria. Our relationship is relatively new. What gentle and kind people they are! I enjoy both of their blogs! I am so grateful to Maria for helping to connect me to those that might enjoy my work! I have two daughters, Hannah and Sarah Kate. Hannah is now thirty and chooses to live with us. For a thirty year old who would like her own house, this is big! We are enjoying her and she is literally the right hand of Little House Home Arts. I need to blog about her. She is amazing…She is a graphic artistic by trade, and is so very multi- talented! She gardens, and cooks and designs privately and for the garden business that she works for, and is involved in teaching kids crafts, gardening and theater arts. We are both strong personalities and so we sometimes synergistically bounce off one another and sometimes we struggle to work together, as we can be very bull-headed and lock horns!! I am so grateful for her instruction and support in getting me on line, as well as teaching me what she knows about color and design and business! Sarah Kate is soon to be 25. She is also an artist, but is more of a studio artist. She completed her BA in Art with honors, but for now is working odd jobs to emancipate, having “boomeranged home” for the summer to regroup. She is hoping to move out in another month or so. My girls are so different, and she too is a strong personality that goes in a different direction altogether! I am blessed to be sure, sometimes too much so!? As yet I have no grandchildren, and how nice that you do! Hannah is a nanny for a set of 4 year old fraternal twins, so we get a small dose of small children, and love it! I can only imagine how fun it is to have grandkids! I used to be a special ed teacher and consultant and loved working with children. How nice that you spend time with your daughter and her children!! How fast they grow up! Thank you again, and let me know if you would like a specially designed pincushion. I am going to be designing more penny-rug style pincushions (these would be the ones that are rather primitive designs and many are black with fun colors), as well as more fruit pincushions. Hannah will be posting some fall pincushions and coin purses, and I am presently trying a new pattern for tiny candy corn pincushions. I plan to do some Christmas wares after doing these. We also have not posted my Ozark doorstop hens, made from a pattern I got in the Ozarks some 40 years ago, and have a special blog to go up about them as well. I apologize that we are so slow in getting my wares and blogs posted. I am not yet independent in terms of all the ins and outs of blogging and posting on Etsy. Hannah is so busy that I really need to learn “faster” and be less dependent on her! All in good time! Cindy, I forgot to add that I will post information about my sale schedule. 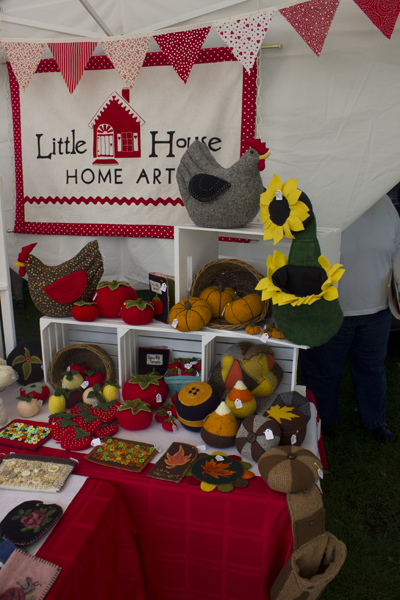 My next is in October in Hinesburg, close to Burlington, and then we will be back in our own area doing sales in November and December! I would visit with you in person and it would be nice if you could see all that we have to offer! Penny Rug Art Goes Political!